Kongregate and Double Stallion Games have announced 2D combat-racer game Speed Brawl is releasing on Nintendo Switch in September 2018. In Speed Brawl, players have to move fast and hit their opponents hard, maintaining momentum stamina to unleash powerful special moves. Check out the full rundown and first trailer below. Kongregate, a leading publisher of mobile, console, PC, and web games, reveals the first gameplay trailer for Speed Brawl, a not so classic beat ‘em up that cranks the speed up to 11. 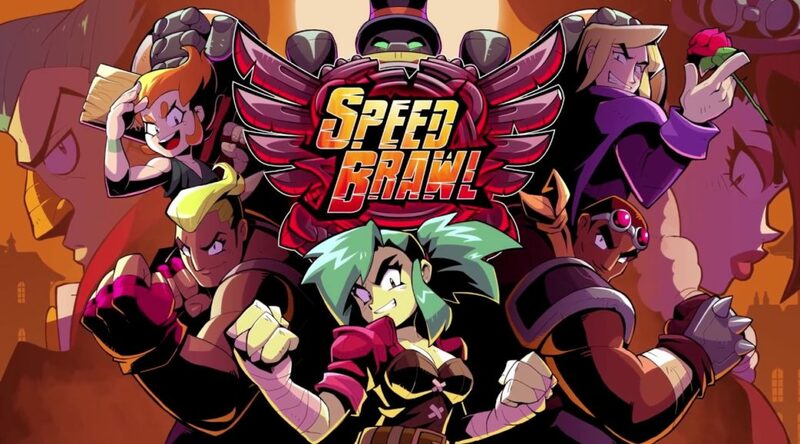 Developed by Double Stallion Games, Speed Brawl is a 2D combat-racer with management and platforming elements. It’s about moving fast and hitting hard, maintaining momentum, and judiciously managing stamina to unleash powerful special moves! Razor sharp visuals and beautifully animated characters. Over 50 unique action-packed championships and challenges. Build a tag-team from 6 vibrant brawlers each with unique play style and distinct personalities. An imaginative and humorous story throughout will reveal high drama and even higher stakes for each brawler! Suit up! – Devise your brawler’s optimal loadout. Buy, win, and sell equipment to fashion the ultimate fighters. Invest in skill upgrades for heavier hits and flashier style. A fluid and deep combat system. Speed Brawl’s freeform combos let you chain together ground and air combos, special moves, assists, and tag attacks for ultimate devastation. Move on up to the big leagues! Conquer escalating hazards and devious bosses in the Threepenny, Sixpence, Florin, and Crown leagues. Each league is run by a unique and diabolical league owner with their own plans to halt your Speed Brawl career. Gotta go fast! – The faster you are, the harder your hit. Go for gold and blast through to the finish line. Brawl solo or brawl with a friend – Online and local co-operative play throughout! Speed Brawl is set in a dystopic Victorian era London. After a decade of war with the Lunar invaders named the Selenites, the British Empire finally vanquished the insect-like menace; following the war, the Selenites became the new workforce of our industrial revolution, ushering in a new era of progress and prosperity. However, listlessness and disobedience rampaged throughout the middle and working classes. In order to satiate the masses, the ultimate entertainment, Speed Brawl, was created; an elite sport where only the bravest, the fastest, and the most worthy warriors could wage a petty war against the Selenite hordes. To prove your worth in this chaotic world filled with colour and calamity you’ve gotta fight, for your right… to… Speed Brawl!